Western Pa has definitely been slammed with the same snowmageddon that is hitting the rest of the mid-Atlantic. I don’t think we will be dining on the deck anytime soon. Or grilling for that matter. Funny thing is, DH grilled a hamburger on this very grill just last Friday… before the snow arrived. While walking out to feed the chickens today Duncan decided he couldn’t be more than 6 inches behind me. This is all well and good when we are just walking, not so great when we are trudging through thigh high snow. He went down while I brought my foot up and off came my boot, to be buried in the 2 1/2 feet of virgin snow. The chickens are in a part of the garden that doesn’t see the plow so the snow is very deep and fluffy. Needless to say my boot was lost in the abyss. So now I am down on my hands knees searching for the the blasted boot. Duncan thinks mom is playing a wonderful new game and wants to help. Pouncing, pouncing, pouncing is fun, mom. Found the boot and of course it is full of snow. Bang the boot on the feed bucket and try to squeeze my snow encased foot into the boot. Thank goodness for handknit wool socks. My foot never got cold or even a little wet. Got to make me some more of these socks. I didn’t want to use the Dale yarn so I have substituted some gorgeous Rauma Finnulgarn in colors that are close to the original. The body is finished and the sleeves are almost ready for the color work. Doesn’t look like I will be making the opening ceremonies but I hope to be wearing this little gem during the games. I also made it a cardigan. Finding cardigans more to my liking these days. So will have to think about how I would like the front bands to look. Maybe some more X’s and O’s. I will be demonstrating crochet steeks and cutting your steeks at the Pittsburgh Knit and Crochet Festival this Saturday. 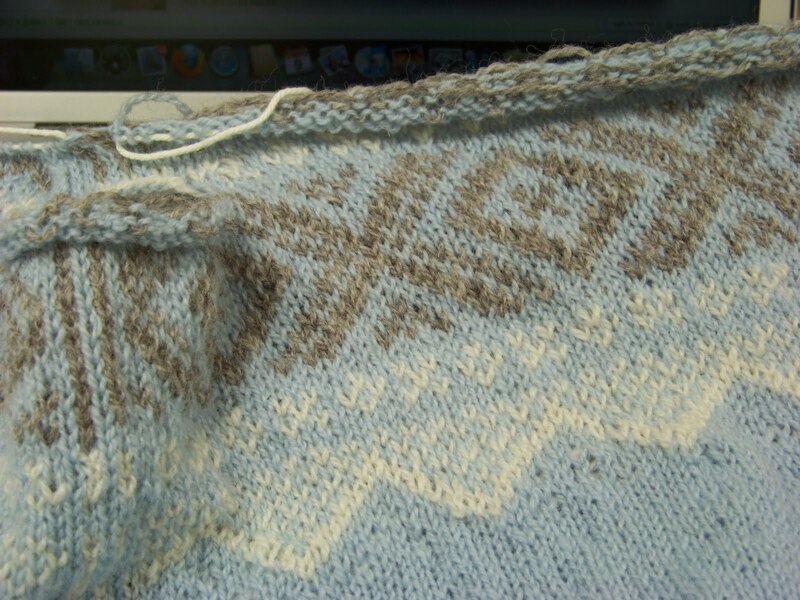 I thought I would leave the neck steek closed until the festival. It is short and will be easy to crochet and then cut open on an actual sweater. I have also been knitting lots of plain swatches for attendees to crochet and cut on their own. Not too thrilled with how uneven the stitches are on this sweater. The color work is OK but the plain stockinette looks for yuck. I am hopeful a trip through some warm water will make the yarn bloom and all will be right with the world. I have a long queue of knitting to start but have some secret knitting that has priority right now, so the knitting will be a little spotty for a while. Hope there won’t be anymore snow pictures to share either. If you are in the Pittsburgh area and can dig yourself out try to make it to the Pittsburgh Knit and Crochet Festival. I will be near the Knit One booth on Saturday afternoon. Stop by and say hi. That's some awesome snow, we haven't had snow like that here in Ireland in about 30 years. Enjoy the games, would love to go. You will get to see Ireland win all them gold medials, luck you.